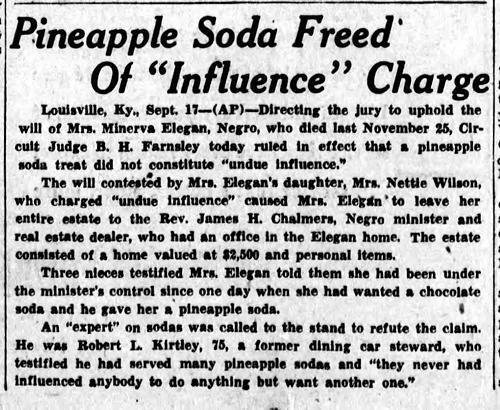 1947: Once Minerva Elagan had accepted a pineapple soda from Rev James Chambers (Chalmers? ), she was under his influence forever. Weird as this is, my favourite part of it is the final bit of Mr. Kirtley's statement. I wonder if it's too late to try this on some of those girls I had a crush on in high school? There is never enough information in these articles, is there? The daughter might have had a point, depending on what the good Reverend put in the soda besides pineapple. I'm still trying to figure out how you "ply" someone. Does it just apply to sodas? Steak and lobster? Is is leftover from Middle English? Perhaps the derivation of the word "plywood" is in here somewhere. @Virtual: I went over to the Online Etymology Dictionary and found that it's a bastardization of "applien" from the 14th century. You know, sort'a like nobody on TV can say the word ambulance anymore it just HAS to be an "AMBO" because time is so short! Way, way back in the mid 60's when I was slingin' soda (pop) we still carried several 'flavors'. The plant wouldn't run these flavors but occasionally and then only in the summer. We had one customer that lived on strawberry and he's stock up for the winter so the charge is not, totally, without foundation. As we never sold pineapple I can't attest to any magical powers it may, or may not, have. Fun Fact: Mountain Dew (which I helped introduce) was NOT considered a 'flavor' regardless of how sweat it was. Funner Fact: I would like to dispel any and all rumors to the effect that the employees of the Pepsi plant were made to line up each AM and pee into the open Dew cans to create that yellowish drink. Hey Expat, did you intend to say Mountain Dew was sweat, or might that be one of those Freudian things? I wonder if this could be like the 'pineapple juice' W.C. Fields had available when he was working on the movie sets. 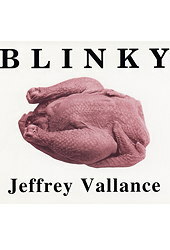 He claimed he was on of the best movie comics by also being one of Hollywood's top alcoholics. @VC: I saw that just after I hit the 'post' button but, you're right. Anyone that worked the drink trucks back when glass bottles were all the rage will agree with me. There was a lot of sweat getting the sweet to the customers. Oh I thought you meant it tastes as bad to you as it does to me sweetie. Bleck! Well, ok.. I can accept that too. My brother used to drink the stuff but I never, really, enjoyed it. I do, however, have to admit that it's WAY, WAY better than Pepsi Chrystal was. Like, gag me with a spoon. Or new coke which totally sucked. My son looooves mountain dew, I just do mot get it.